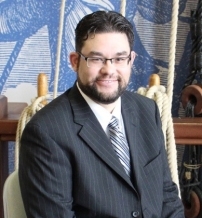 E. Shawn Waskiewicz is the Executive Director of the Flagship Niagara League and Chairman of Tall Ships Erie. He has served as the Director since February of 2012. Mr. Waskiewicz’s main responsibilities include managing day-to-day operations, securing grants and sponsorships, and managing Tall Ships Erie. He graduated from Edinboro University with a B.S. in Business Administration and received his M.S. in Organizational Leadership from Mercyhurst University in 2011. He was named the “Walker School of Business Graduate of the Year.” Mr. Waskiewicz resides in Fairview with his wife, Meghan, four children, and dog, Rufus.